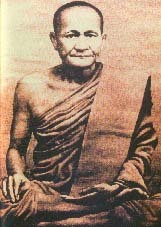 Luang Por Pahn was the 3rd abbot of Wat Bang Nom Koh. He was borned on 16th July BE2418 in Jangwat Ayuttayah. He came from a farmer family. He was just borned with a red birth marks on his left hand, so his parents named him as "Pahn", which means birth marks in Thai. Luang Por Pahn was ordained as a monk in 1st April BE2438 at the age of 21 years old. His preceptor was Luang Por Sun from Wat Pahngplahmor. Luang Por Joi Wat Bahnpaen and Pra Ah Jahn Oun Wat Sutahpoh were his dhamma teachers. Luang Por Pahn ordain name was Sohnantoh. After he became a monk, he learned from Luang Por Sun Wichah. Luang Por Sun taught Luang Por Pahn everything he knew about Wichah (magic chant), sammahdti and especially the skills to cure people from illness and black magic (during that period, there were very few doctors, so some monks learned this skill of curing the sick). After learning from Luang Por Sun, Luang Por Pahn went to Tudong alone in deep forest, but not too long he met some monks who later became his disciples. He went Tudong from Ayuttayah to as far as near Burma in the North West of Thailand. Luang Por Pahn also learned from Luang Por Niem Wat Noi and Luang Por Nong from Wat Kongmahdan. Both these teachers were very skillful in Wichah and sammahdti skills. Luang Por Pahn studied Pali from Tahn Ah Jahn Jeen Wat Jowjet for 2 years as well. After which, he went Bangkok to Wat Saget for 5 years to continue Pali studies. Luang Por Pahn achieved the highest grade in Pali at Wat Saget. Luang Por Pahn returned to Wat Bang Nom Koh. He built a school for novice to study Pali and Dhamma. He also re-built Wat Bang Nom Koh from a small temple to a much bigger one that stood until today. Luang Por Pahn also help to re-build as many as 41 others temples in Ayuttayah. Luang Por Pahn was a very good and virtous monk whom many people respected. Whenever, the people heard that Luang Por Pahn wanted to re-build any temples, people from the town and villages would come forward to help. Thus, the re-building of many temples, were funded by donations from the people themselves. Besides busy with the tasks of re-building temples, Luang Por Pahn also cured many people in the village of sickness and black magic. Anyone who went to Wat Bangnomkoh would not be disappointed and would be quickly cured of their illness or from black magic spells. Luang Por Pahn used Num Mon (holy water) and herbs gathered from mountains, together with his sammahdti power to cure the people. If you know the story of Luang Por Pahn, you will know that Luang Por Pahn was a monk that many people respected because he was able to re-build 41 temples and many chanting halls without asking any help from the government. The money were from the making of amulets and donations from devotees. Luang Por Pahn passed away on 26th July BE2481 at the age of 63 years old.